Buck's Pizza in DuBois opened in April of 2010 as a small carry-out only location that was attached to the Buck's Pizza Franchising office in what many believed to be a crazy location. Maybe it was crazy, but it worked! Initially, our staff was primarily family with some very close friends helping as well. We grew the business over the years and eventually decided to add a dining room. So, after a lot of sweat and a little blood, we opened up the dining room in June of 2012. The dining room was a hit and we've continued to grow. Eventually, we decided to expand the dining room further. To do that, we moved our franchise office out of the building. So, the summer of 2016, we added another room to the dining room. We now have the room necessary to seat our guests without a wait! We are also able to host private events. Through the years, we have evolved, added crew members (that are still close like family), added menu items, added parking and more tables. What we have not changed is our commitment to serving the best food that we possibly can and doing so at a fair value to our customers. If you are a customer: thank you for your continued support. If you are not yet a customer: we look forward to serving you! 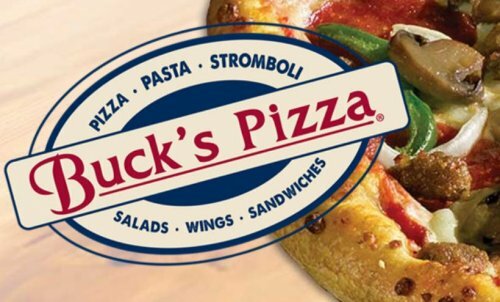 FaceBook FUNDRAISING INFO ----------------------------- Newest Location is in Clearfield, Pa.3055 Park PlClearfield, PennsylvaniaCall (814) 765-7767FaceBook | Website |Buck's Pizza in Clearfield opened in November 2014. We are located in a picturesque spot overlooking Raftsman's Memorial Timber Dam on the West Branch of the Susquehanna River. Our dining room offers great views and in the summer our patio offers a wonderful view of the river and dam.While pizza is part of our name, we also have much else to offer. Our menu includes delicious fresh salads, sandwiches on fresh baked bread, hand-breaded chicken tenders and boneless wings, jumbo chicken wings, strombolis, appetizers, desserts and an extensive variety of pasta. There really is something for everyone.We enjoy being part of the Clearfield community! We have found wonderful employees and customers that make doing business in Clearfield a great experience.If you are a customer: we appreciate your support! If you are not yet a customer: we look forward to serving you.